(CNN) -- A fishing boat carrying two NFL players and two other men capsized last month because it was improperly anchored, a Florida agency reported Friday. 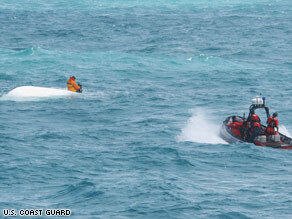 Nick Schuyler clings to an overturned boat in this Coast Guard photo. One man survived; the other three are still missing. Oakland Raiders linebacker Marquis Cooper, NFL free agent Corey Smith and former University of South Florida players William Bleakley and Nick Schuyler went overboard February 28 during a fishing trip. Schuyler survived the accident, which happened 35 miles west of St. Petersburg, Florida, in the Gulf of Mexico. The Florida Fish and Wildlife Conservation Commission said the men were unable to pull up the anchor of their boat to head back to port. Cooper tried to rev the boat forward to free the anchor, but the 21-foot single engine craft then capsized. The report said that the "improper anchoring" to a portside bracket, the attempt to throttle the boat forward to release the anchor,and the "failure to leave enough slack anchor line to compensate for top-water Gulf conditions" caused the accident. Schuyler told his rescuers that the boat was anchored in the evening when it was overturned by waves during a storm. He told them that all four men were clinging to the boat for a time, but became separated. The four men embarked in a 21-foot single-engine boat from the Seminole Boat Ramp near Clearwater Pass about 6:30 a.m. February 28, the Coast Guard said.